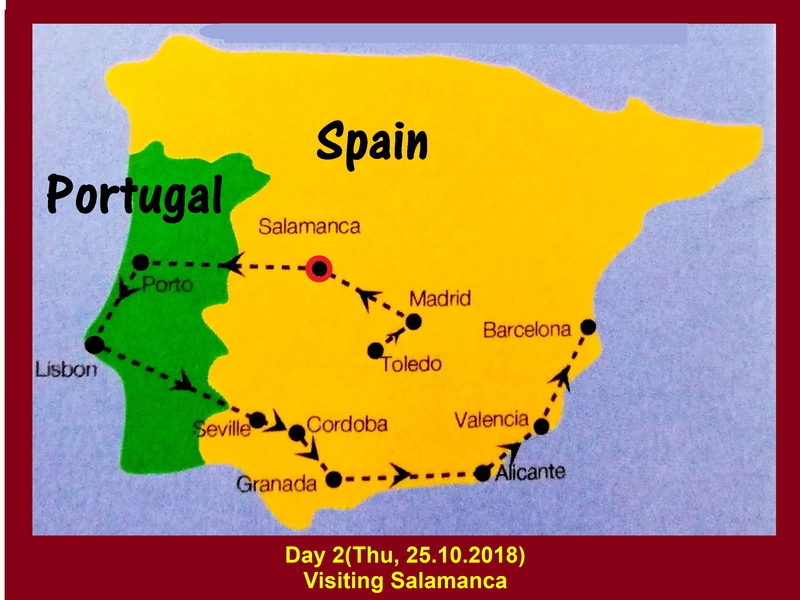 On this day, we were going to visit Salamanca. 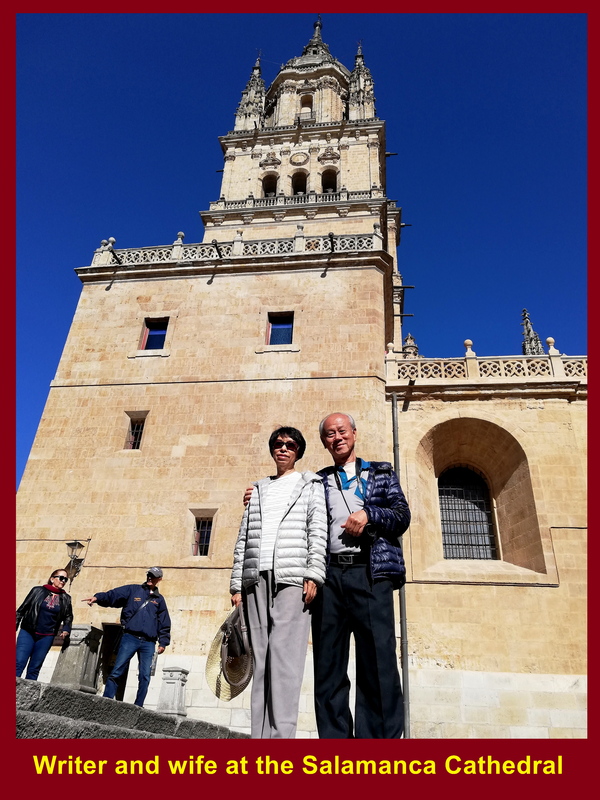 We left Hotel Puerta de Segovia in Segovia in the morning and travelled 310 km west to Salamanca and the travelling time would be 3 hours 20 minutes. 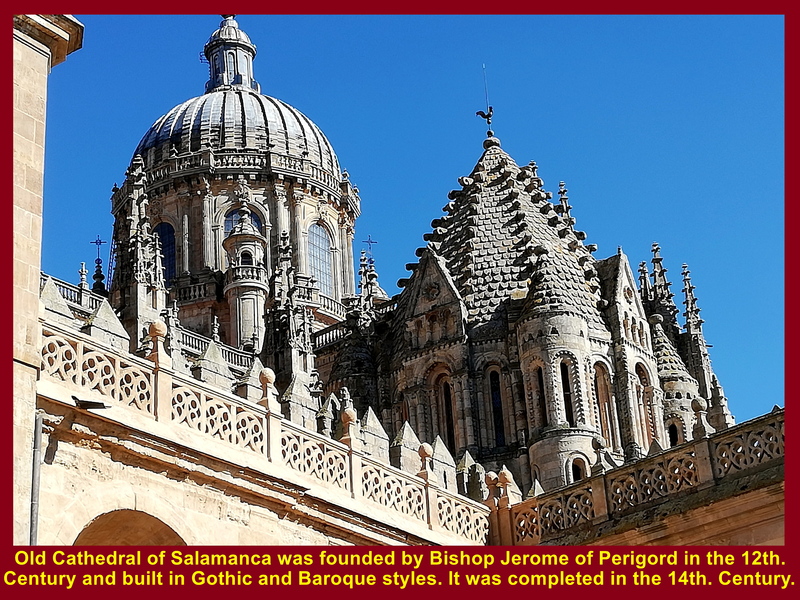 Salamanca was first ruled by the Romans, then the Christian Visigoths from western Germany, later the Muslim Moors from North Africa and finally the Christians again. 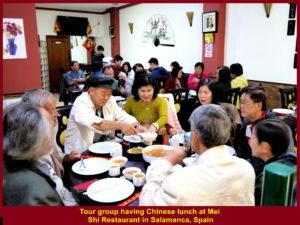 The economy of Salamanca depends mostly on tourism and students going for university education in the old town. There are few heritage sites and old churches that attract tourists to Salamanca, including Roman Bridge, old churches, the oldest university in Spain and old public squares. 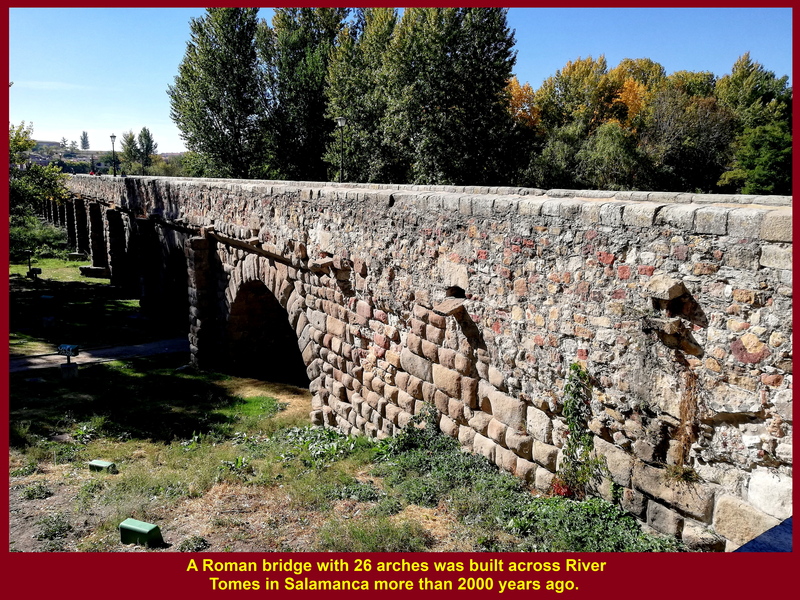 The Roman Bridge that crosses River Tormes in Salamanca was built over 2000 years ago. It is 176 metres long and 37 metres wide. 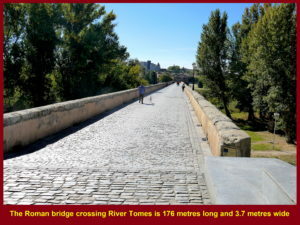 Roman Bridge crossing River Tormes was built over 2000 years ago in Salamanca. The Roman Bridge of Salamanca is 176 m long and 3.7 m wide. 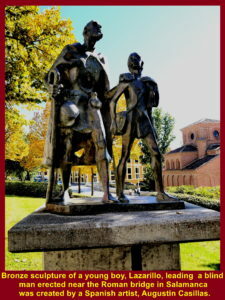 Erected near the Roman Bridge is a bronze sculpture of Lazarillo, a young boy leading a blind man. It was created by a Spanish artist, Agustin Castillas. This monument is dedicated to the anonymous novelist who had written a story titled “The Life of Lazarillo de Tormes”(published in 1554). The story is about a poor boy who is sold to some masters who treated him, cruelly. At the entrance of the Roman Bridge, there is a sculpture of a headless boar on a high pedestal. 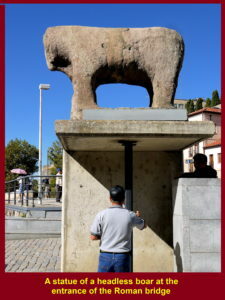 This stone animal is known as verraco in Spainish. So far about 400 monuments of this animal have been identified, especially in the high central plain of Iberian Peninsula. It is believed that they were created between the 4th. and 1st. Century B.C. and had some religious protective significance. Before entering the old town of Salamanca, we noticed a large gate standing opposite the Roman Bridge and there was no wall for protecting the town in the olden days. There are two cathedrals which are close to each other near the gate. One was built in Gothic and Baroque styles in the 12th. 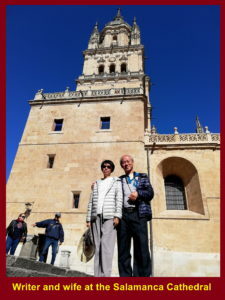 Century and is known as Old Salamanca Cathedral. The other one which is larger was built in Romanesque style between the 16th. and 18th. Century and is known as New Salamanca Cathedral. 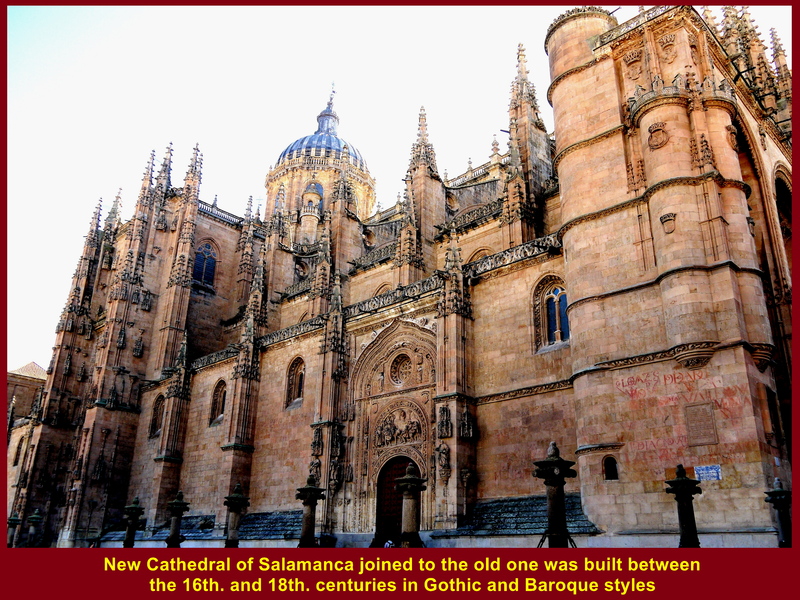 Old Salamanca Cathedral was built in Gothic and Baroque styles between 12th. and 14th. Century. New Cathedral of Salamanca joined to the old one was built between 16th. and 18th. centuries in Gothic and Baroque styles. 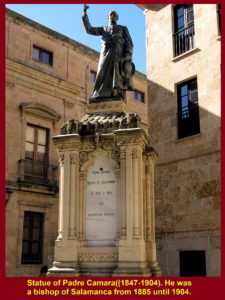 In the Juan XXIII Plaza next to Salamanca Cathedral is a statue of Padre Camara(1847-1904). 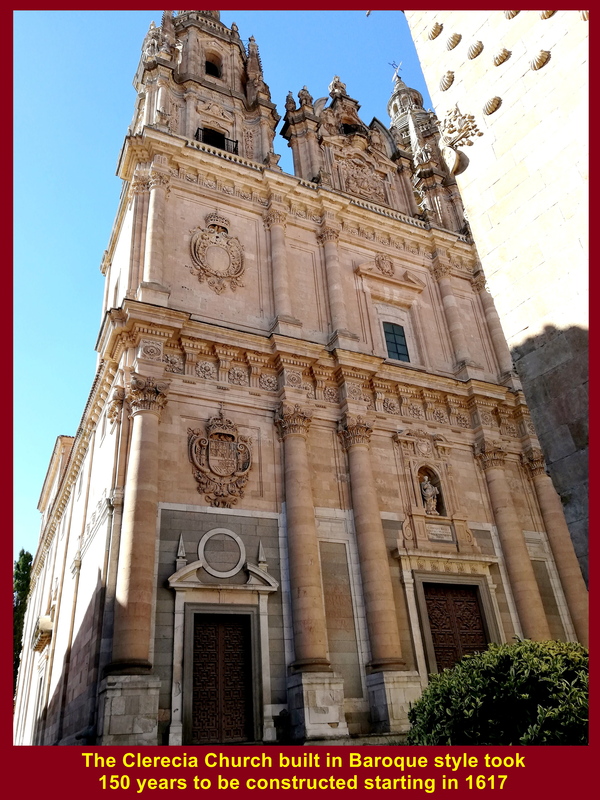 He was a bishop of Salamanca Cathedral from 1885 until 1904. Padre Camara(1847-1904) was a bishop of Salamanca from 1885 until 1904. 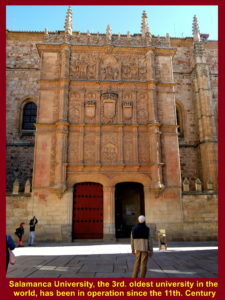 Episcopal Palace of Salamanca is located in the same square. Opened in 1890, it was the residence for bishops until 1964. 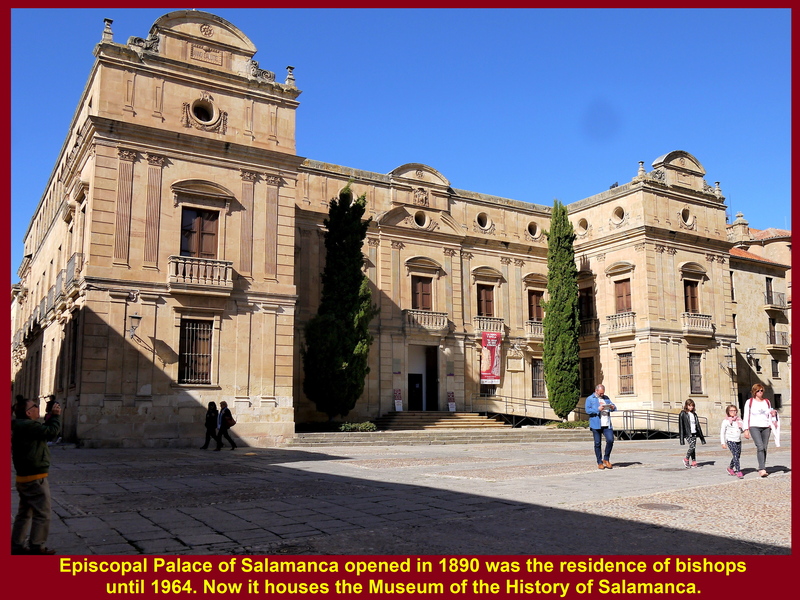 Now it houses the Museum of History of Salamanca. Episcopal Palace of Salamanca opened in 1890 was a residence for bishops unti 1964. 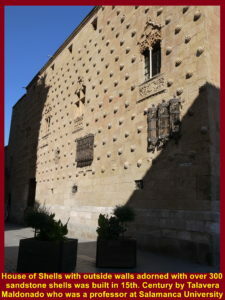 It now houses the Museum of History of Salamanca. Located near Salamanca Cathedral is the 3rd. 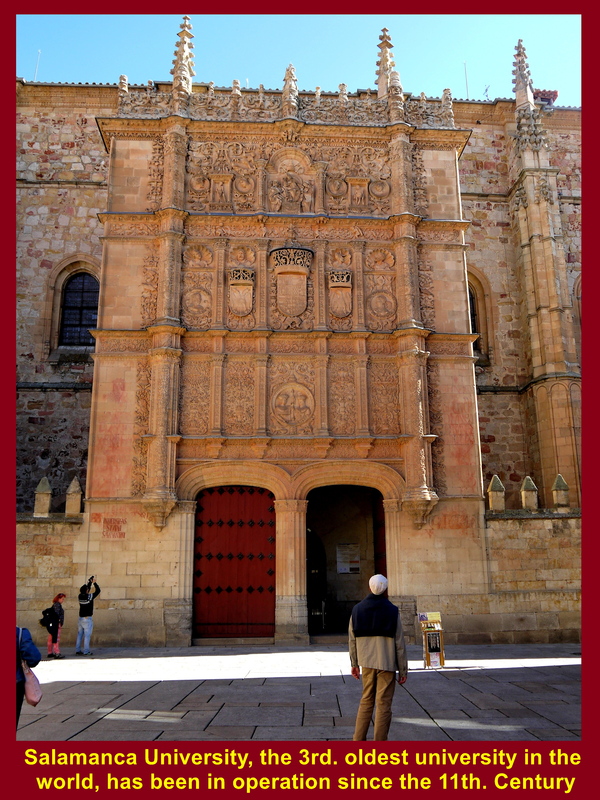 oldest university in the world, University of Salamanca. 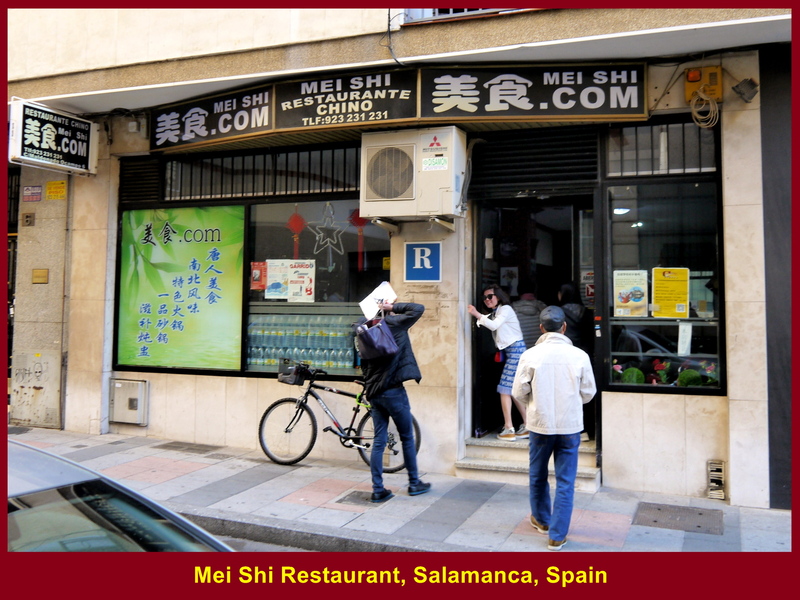 Thousands of students are studying at the university and contribute to the economy of Salamanca, annually. It was opened in the 11th. Century. 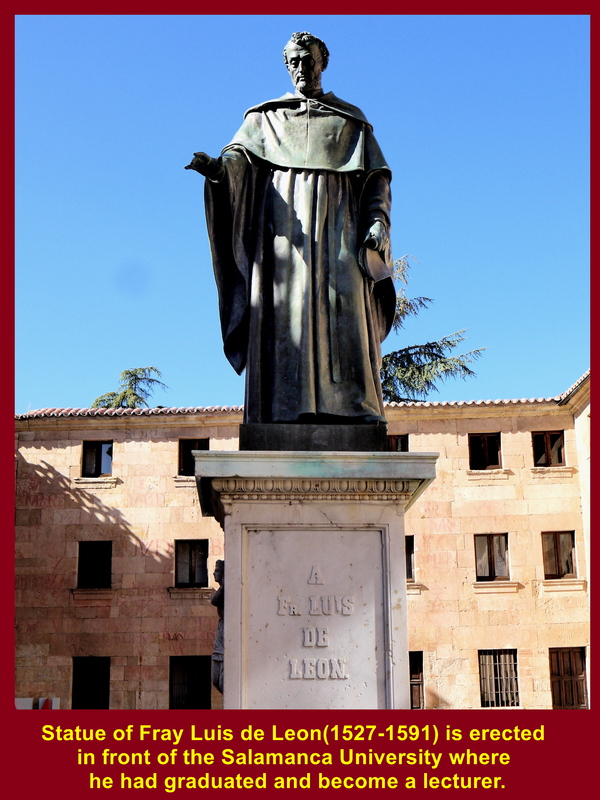 Erected in front of the university is a statue of Fray Luis de Leon(1527-1591). Luis graduated from the university with Master’s Degree of Theology in 1560 and later, he lectured at the institution. Fray Luis(1527-1591) had graduated from the University of Salamanca and became its lecturer. Near the university there is a house that was built in Gothic and Plateresque styles between 1493 and 1517. Known as House of Shelle or Casa de las Conchas, it was built by Rodrigo Arias, a professor of University of Salamanca. It has a unique facade as it is decorated with over 300 stone shells. The shells are a symbol of the Order of Santiago and pilgrims performing the Way of St. James. Besides, the facade has the coat of arms of the Catholic monarchs of Spain and four Gothic styled windows of different shapes. This historical building is now a public library. Right in front of the House of Shells is a church known as Clerecia Church. Built in Baroque style in the 17th. 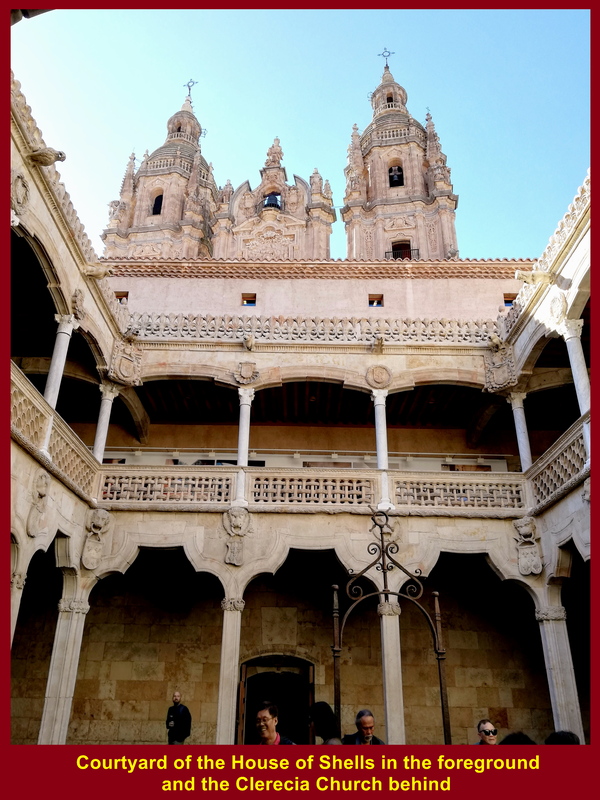 Century as the Royal College of the Jesus, it is now a headquarter of Salamanca Pontificial University. 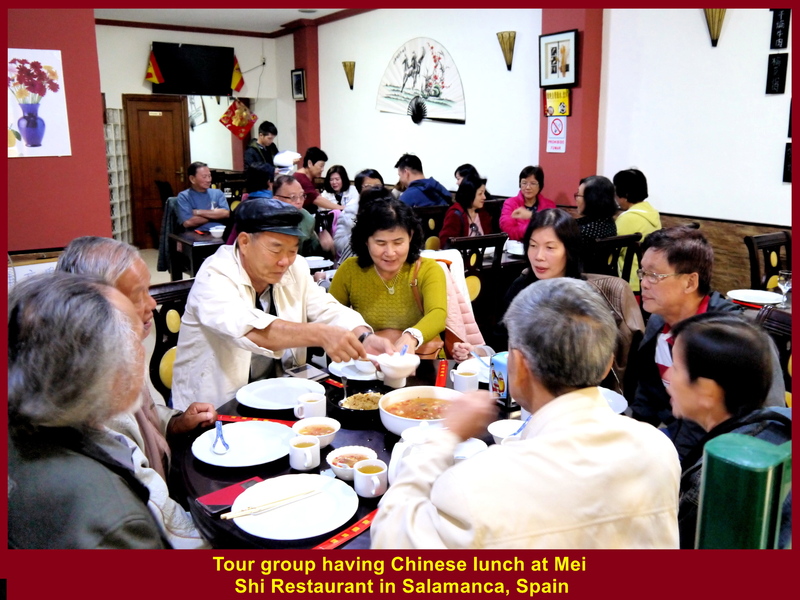 After visiting the landmarks in Salamanca, we had lunch at a Chinese restaurant known as Mei Shi Restaurant in the old town of Salamanca. Then we left the town and travelled to the next destination, Porto in Portugal. 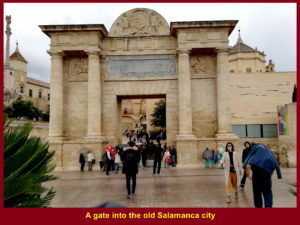 Porta is 350 km west of Salamanca and time taken for the journey is 4 hours.